Chipotle Supports Surfrider in Southern California! 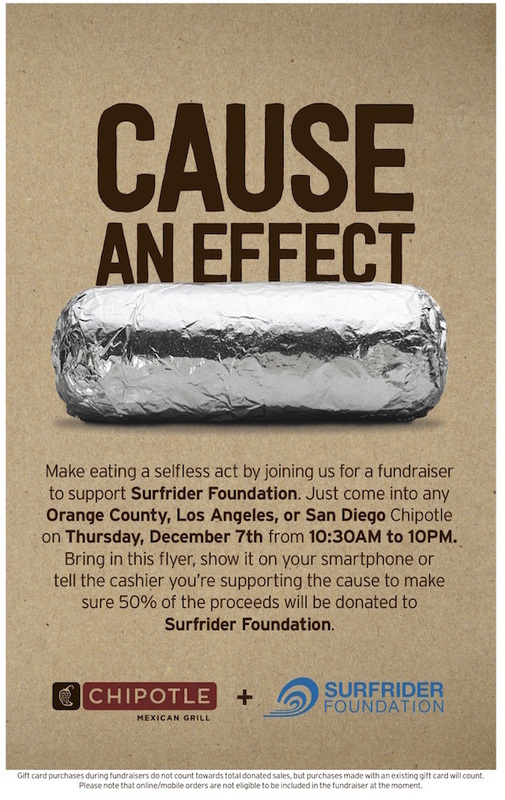 On Thursday December 7, 2017 all Chipotle Mexican Grill locations in Santa Barbara, Ventura, Los Angeles, Orange County and San Diego generously donated 50% of the sale to the Surfrider Foundation to support our mission to protect our ocean, waves and beaches! We are grateful for the opportunity to raise awareness and funds and look forward to future opportunities. *Blog post updated on 12/8/17 to reflect that the fundraiser has past.